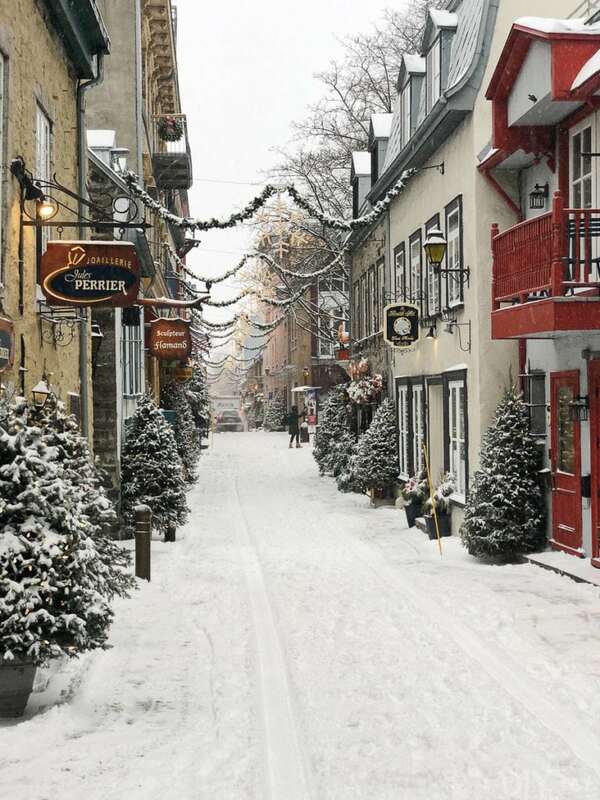 If I could use one word to describe Quebec City in December it would be magical. 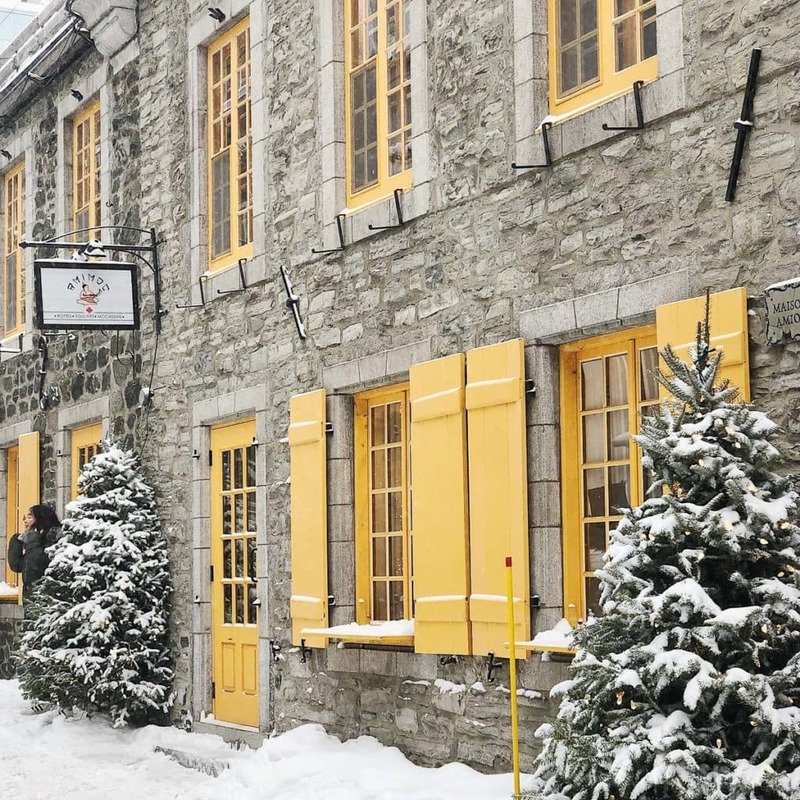 I had seen the photos of this picturesque town on Instagram and read Quebec City travel guides, but I wasn’t sure if it would truly look the way it does in those pretty pictures. Spoiler alert: It’s even better than I could have imagined! After a rough 2018, Finn and I were eager to get away during December and spend some time just us two. With our miscarriage happening in November, the holidays were extra hard on us. Taking a few days to get out of town and reconnect was exactly what we needed. 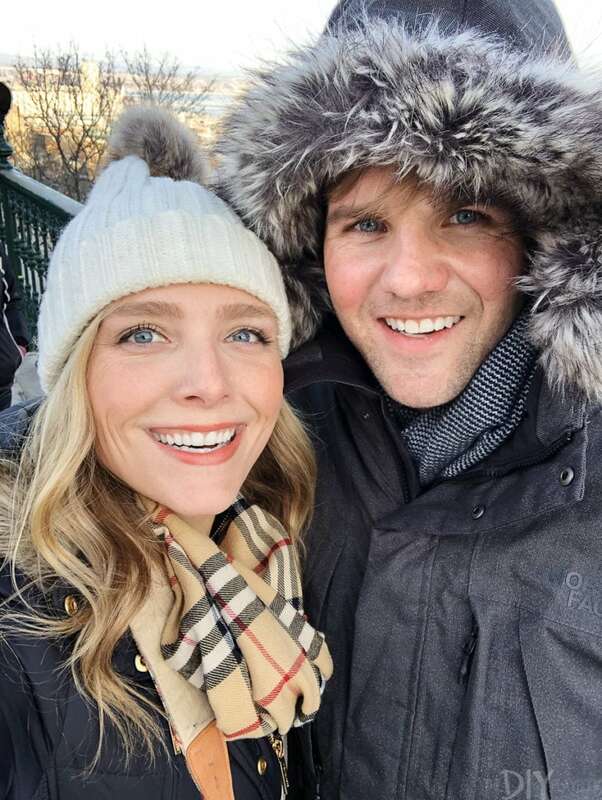 We tried our best to capture all that we were up to on our trip on Insta Stories (you can still view it on our highlights under “Finn Family”), but so many of you also asked for a blog post recap. 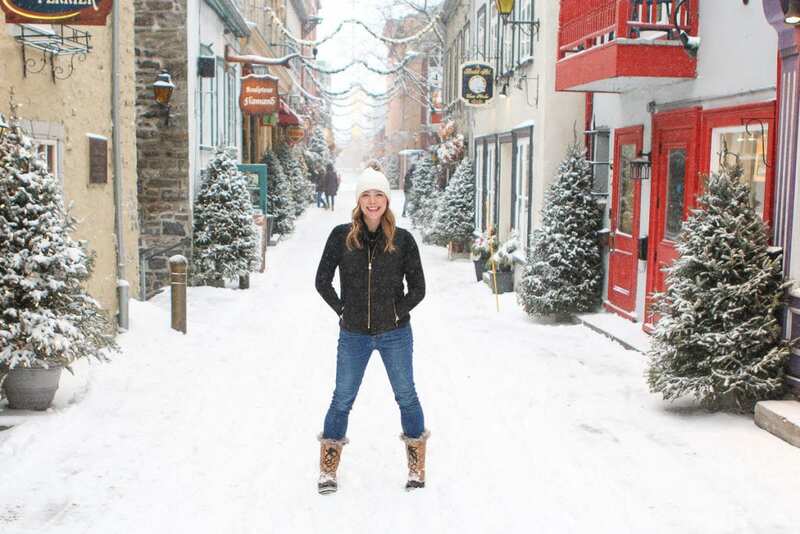 So I’ll do my best to sum it up with this Quebec City travel guide! 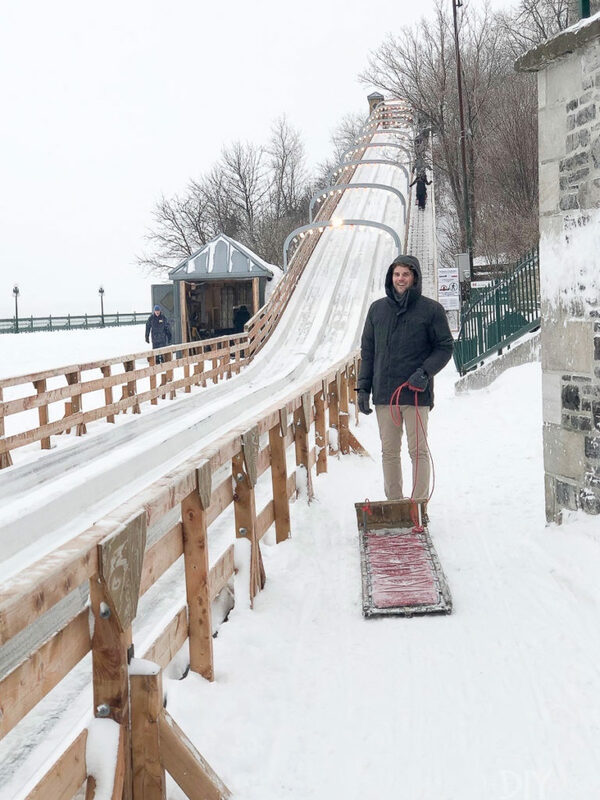 Getting to Quebec City from Chicago was actually incredibly easy. We flew Air Canada from Chicago to Montreal and then had a connecting flight to Quebec City. A friend of mine took a train from Montreal to Quebec City and said that was an easy route as well. We ended up using points for our flights, but even without them, the flights weren’t terribly expensive. We stayed for 3 nights, 4 days and it was the ideal amount of time for us. We felt like we saw everything we wanted to see and tackled most of the city. I’d say give yourself a long weekend and you won’t be disappointed. 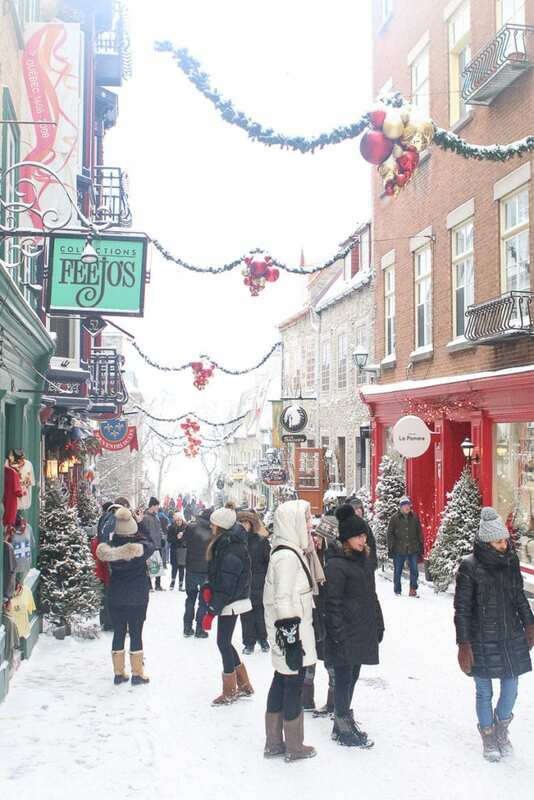 Before our trip, I heard that Quebec City was like going to France…without the long plane ride. That description is spot on. Everyone speaks French (but don’t worry, most speak English too), the buildings are old and quaint, and many streets are cobblestone. I felt like I was instantly transported to Paris at Christmastime. I think that’s one of the best parts of visiting this magical destination. You feel like you’re heading across the ocean, but really it’s just a few hours away! I did a lot of research on where to stay during our visit and a lot of you guys recommended Chateau Frontenac (which is a huuuuuuge castle in the middle of town). Chateau Frontenac comes with a large price tag and tons of tourists, and we wanted something a bit smaller and more low key. 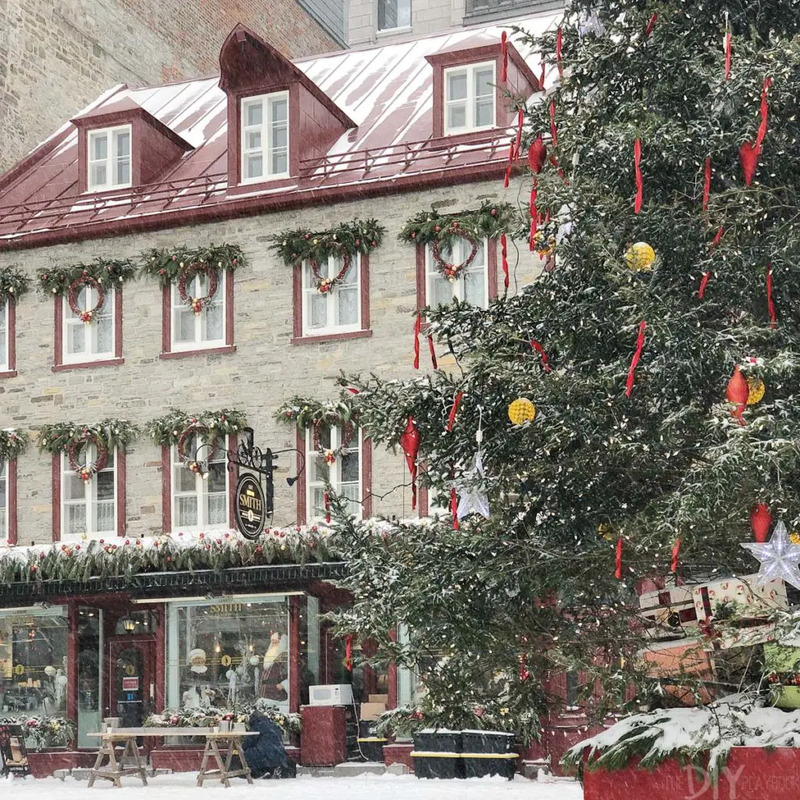 We ended up staying at Hotel Du Vieux-Quebec and it was perfection. The location of the hotel is ideal. We could easily get to the lower portion of the city (the super Christmassy area!) and were near tons of bars/restaurants/shopping in the upper portion of the city. Our room was large and clean and they even offer fresh popcorn and movies you can bring to your room at night (not that we had time for that). 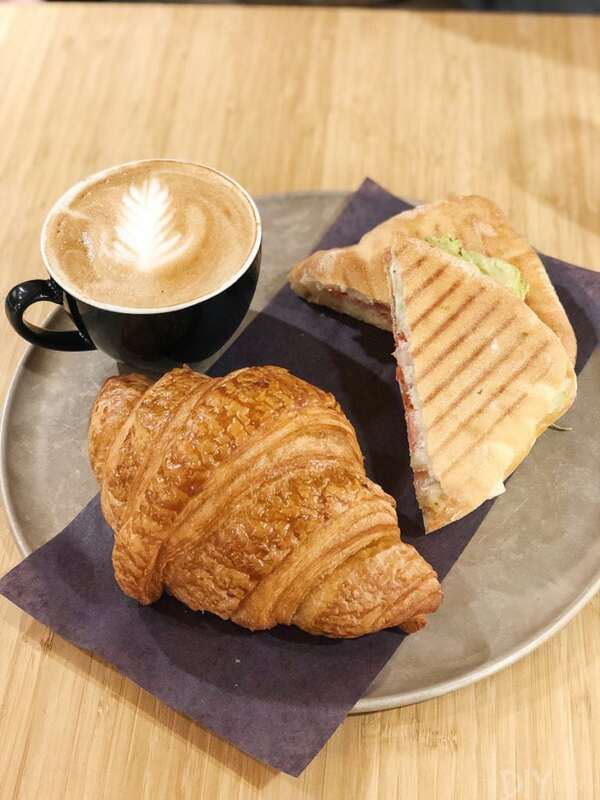 They also have free lattes and cappuccinos in the lobby (yes, please!). I couldn’t say enough good things about this hotel. 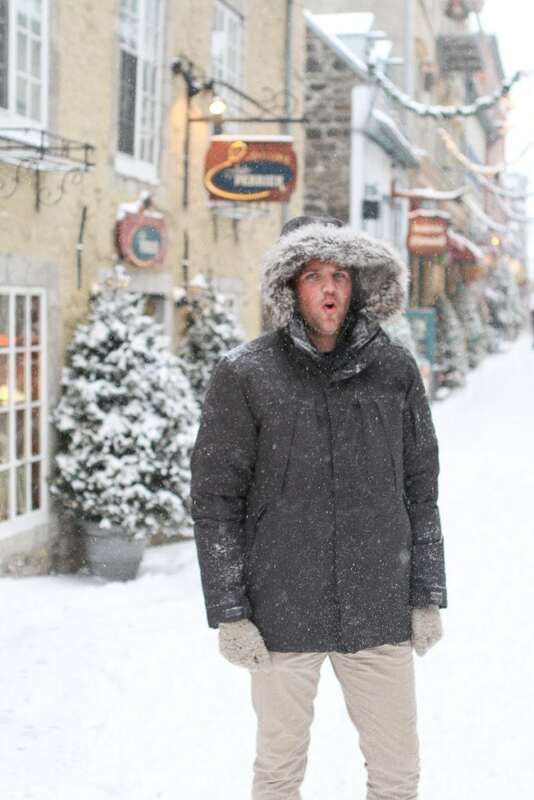 I was prepared for Quebec City to be cold and it certainly was. Our first 2 days it was sunny, but with highs in the teens. On our third day, we woke up to 4 inches of snow and a high of around 32 degrees. As Chicagoans, we’re used to the cold/snow/wind so it certainly wasn’t unbearable. But I must say, you have to pack accordingly! Finn and I both bought new winter coats for this trip (& beyond). Finn got this North Face for Christmas and it’s seriously the warmest coat ever. I put it on and it feels like you’re wrapped up in a comforter. I got this new winter coat for a steal and while it’s not as warm as Finn’s it’s a good one. Definitely pack a winter coat with a hood. 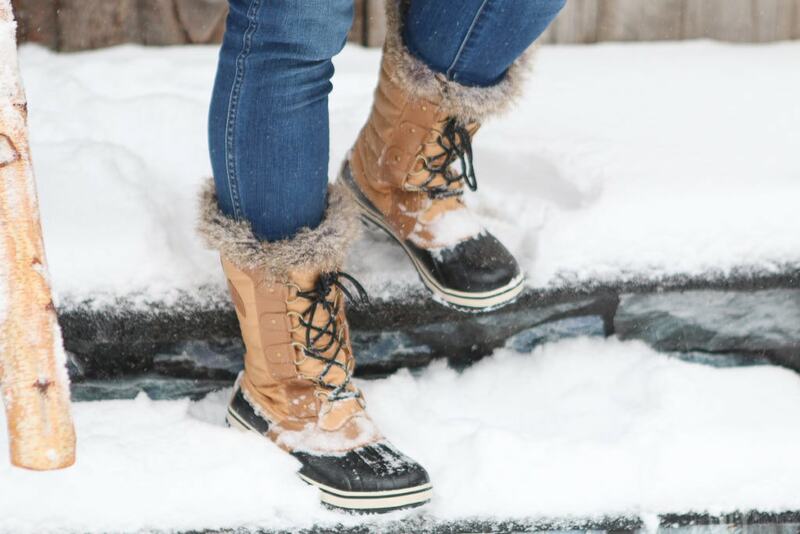 I ended up packing 2 pairs of shoes…these Sorel boots and these Ugg boots. Honestly, I should have only bought the Sorels because I wore them the entire trip. They’re comfortable, easy to walk in, and stylish! I wish I would have purchased these sooner for Chicago winters. Don’t forget to pack lots of socks too! We both wore these smart wool socks and then another pair of thick socks over them. We’d then come home and shower before dinner and put on another pair of socks (so count on at least 3 pairs per day!). 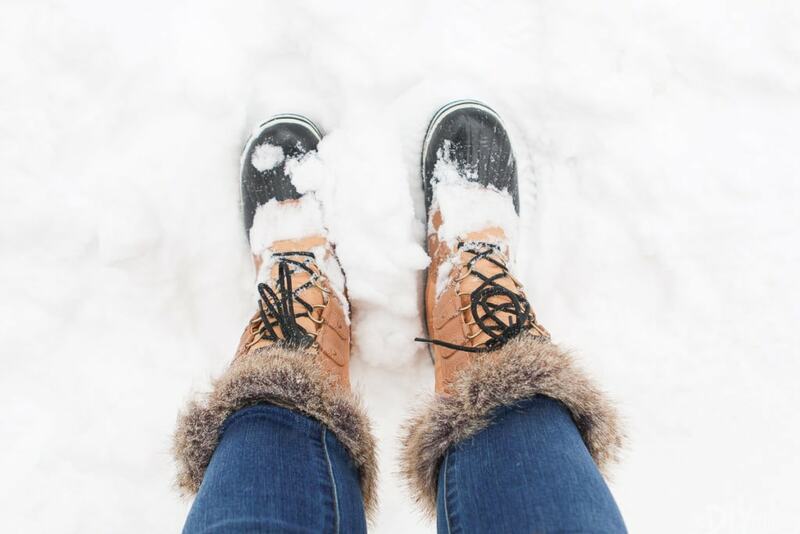 Doubling up on socks and wearing snow boots kept our tootsies warm in the snow and cold. For pants, I brought my Madewell jeans for daytime and these black jeans for nighttime. Underneath, I wore these long underwear. Both Finn and I wore these under our pants and they kept our legs super warm. I highly recommend getting some of these bad boys before you go. On top, I always wore a vest under my jacket. 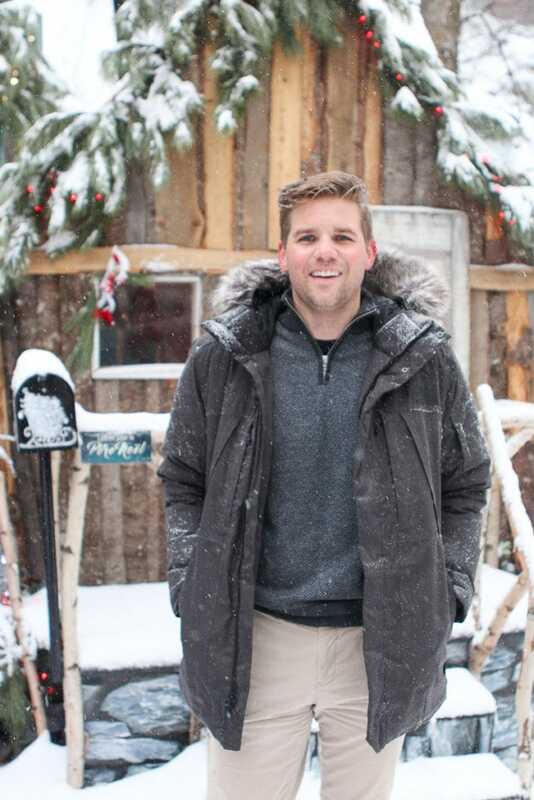 It kept my body even warmer and was easy to take off when heading inside to eat. I also only brought sweaters (like this mock turtleneck) and long-sleeved shirts. To be honest, I don’t really think it matters what you wear because you will mostly have your coat on! Finn was the same, wearing long shirts and then a sweater (like this amazing one) over them. Scarves, gloves, and hats are also a must. I’d bring 2 pairs of each because if things get wet during the day you’ll want to bring fresh ones out for nighttime. Somehow we were able to pack everything in carry-ons, which is a miracle considering all of the bulky items we brought along for the trip. Wearing our coats, boots, and bulkiest items on the plane definitely helped though. 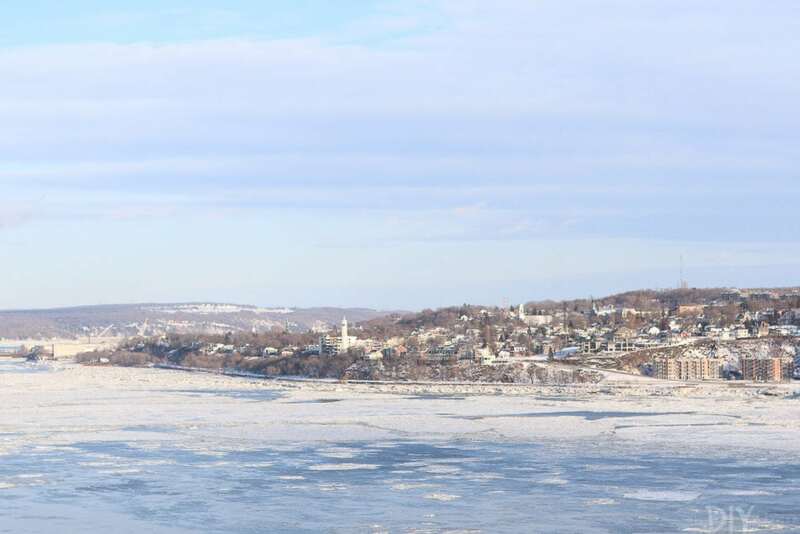 We arrived in Quebec City without much of an itinerary. When we travel, Finn and I like to eat, drink, and explore…and that’s pretty much how this trip went down. 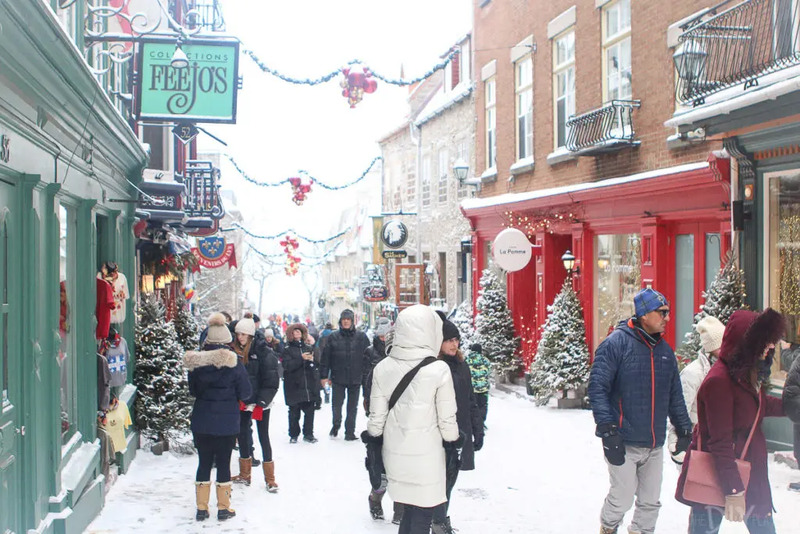 We knew we wanted to hit up Quartier Petit Champlain which is the super Christmassy area you’ve probably seen on Instagram. 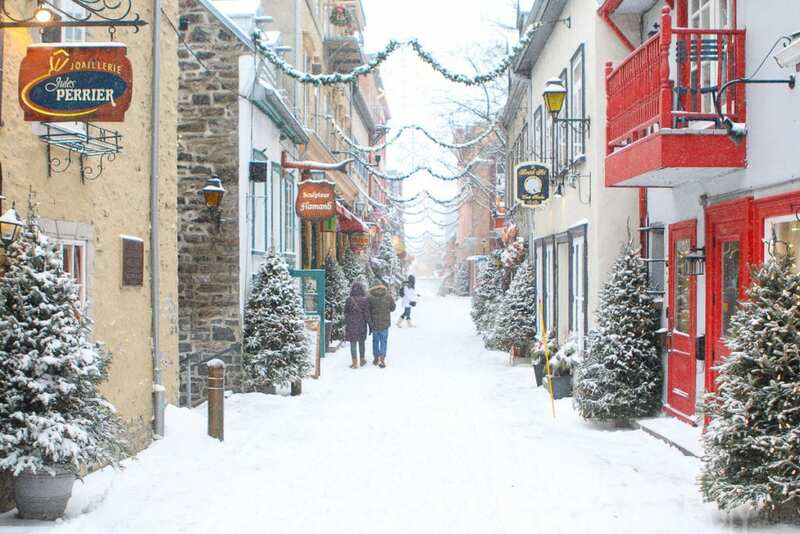 This area is located in the lower portion of the city and the streets are lined with Christmas trees and lights. We visited this spot at night and in the morning and I’d suggest going at both times. We went there our first night and were instantly blown away. There were carolers, Christmas lights galore, and the cutest little shops and restaurants. It was definitely busy, but fun to walk amongst the crowd and take it all in. We also visited this spot in the morning. Most shops don’t open until 10 am, so we headed there around 9 am and it was empty and free of tourists (yay!). 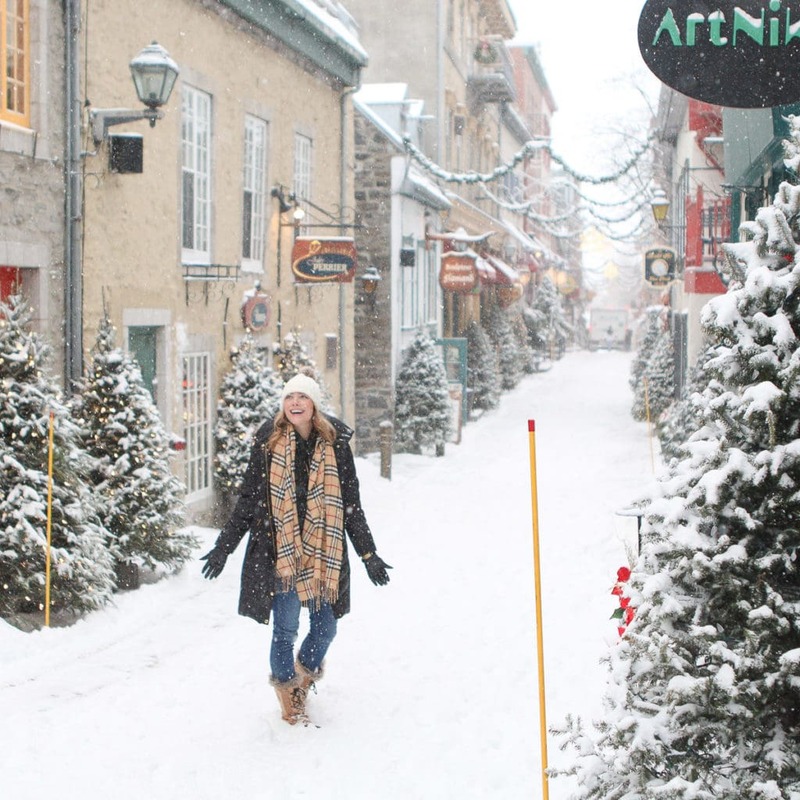 We were able to snap some of these photos and slowly stroll the gorgeously decorated streets. Get up early and do this…trust me! 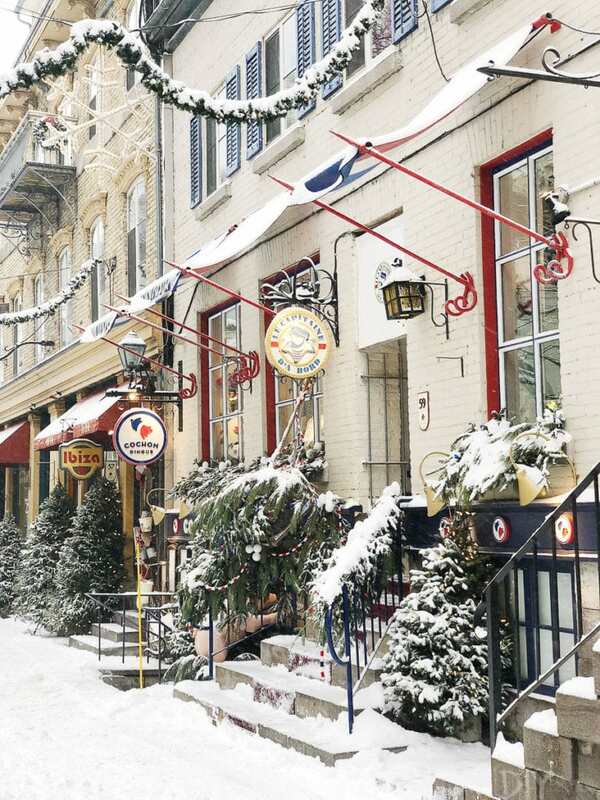 I was most impressed with the storefronts and restaurants and their holiday decorations. 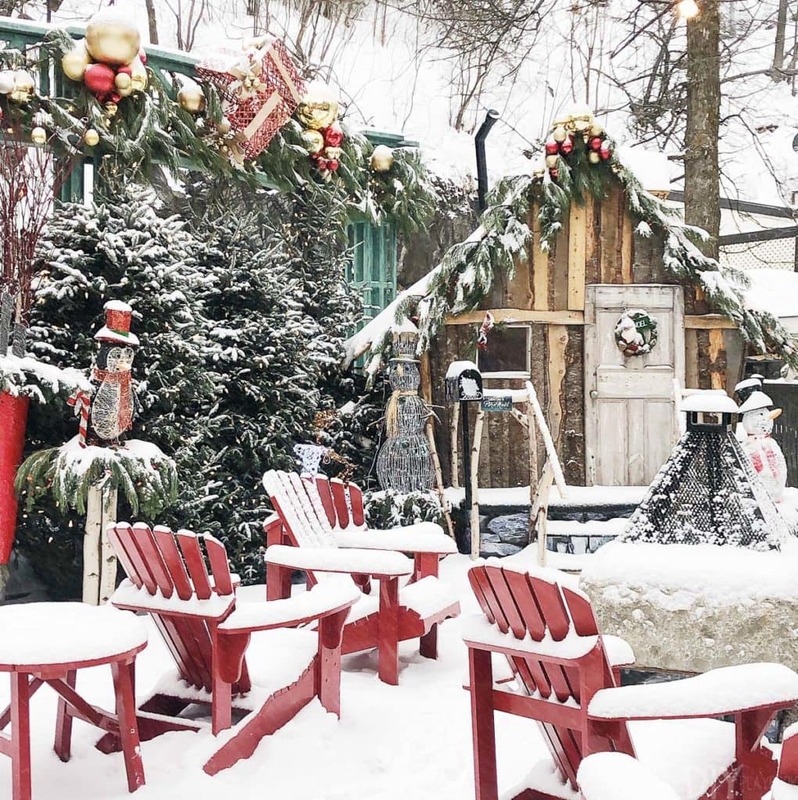 These places go above and beyond to create this winter wonderland. Every single place is decked out and it’s heartwarming to see how much time and energy they put into it. Even though we arrived the day after Christmas, we were instantly in the Christmas spirit. 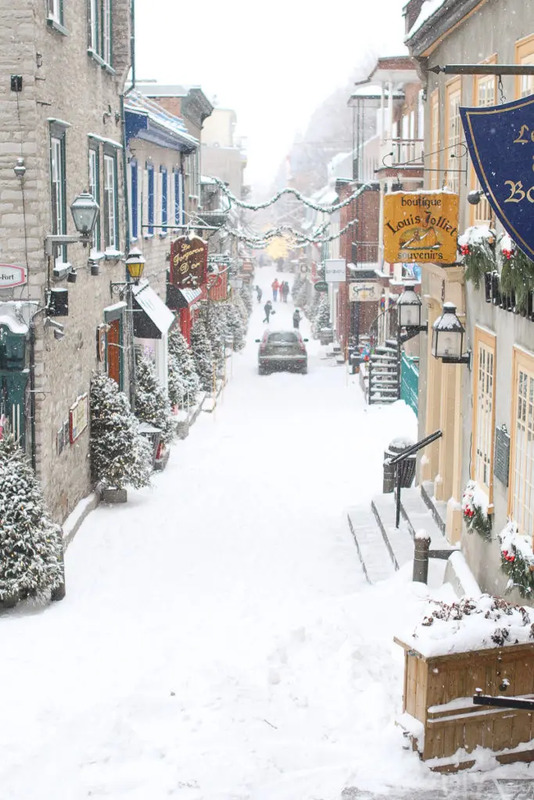 It’s impossible not to be when exploring this area of Quebec City. 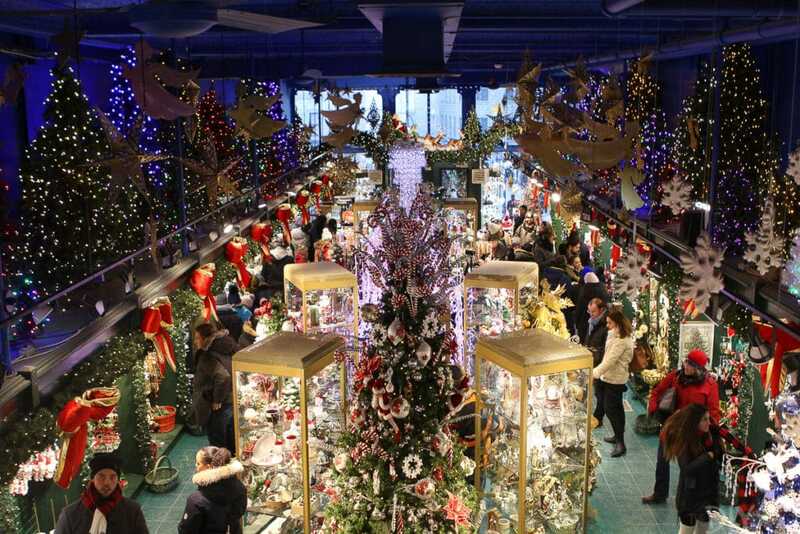 Oh, and don’t forget a visit to La Boutique de Noel. We picked up a few ornaments from this Christmas store! 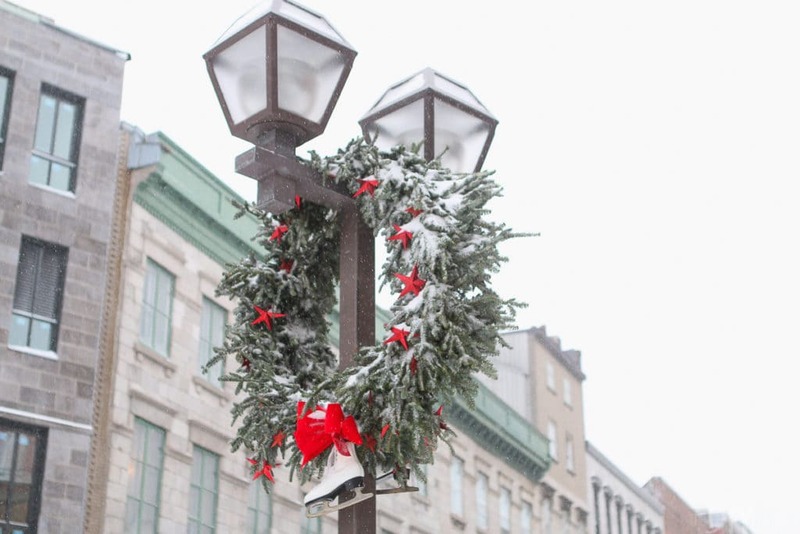 We spent our first day exploring the streets of Quebec. Our second day was all about the spa. 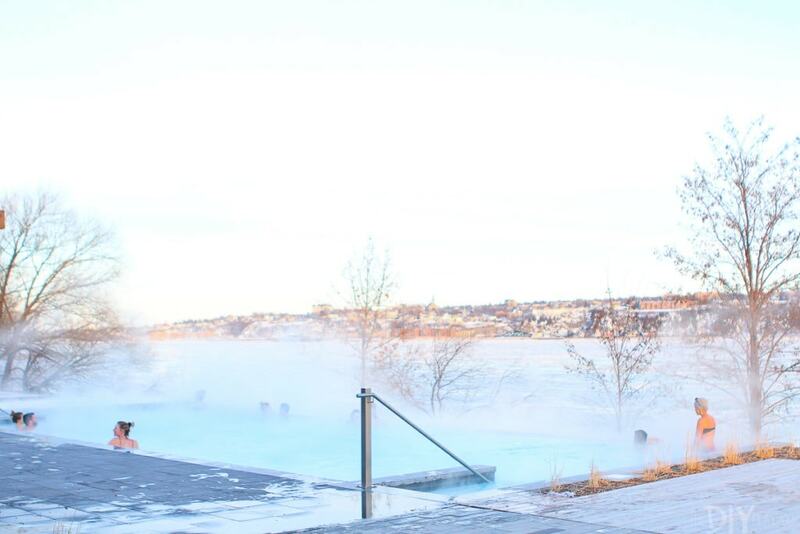 We originally planned to go to this spa, but our concierge suggested the new Strom spa instead. It just opened up in October and he said many guests raved about it. Instead of taking a cab there, we decided to walk. This ended up being quite the experience (and we got lost a few times), as we had to take these long stairs through a forest to get there. It was a 20-minute walk, which made us even more excited to relax when we arrived. 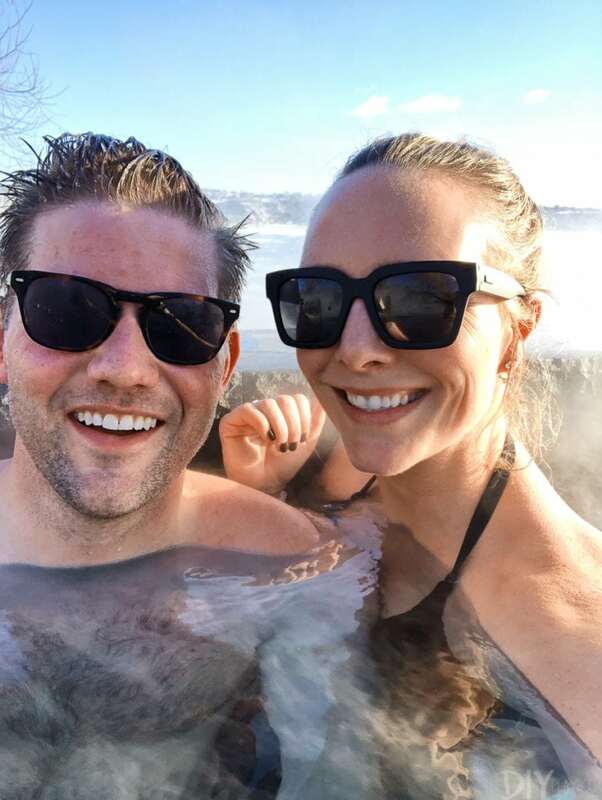 We ended up doing the “thermal experience” which includes all of the outdoor hot tubs, cold pools, saunas, steam rooms, and relaxation rooms. 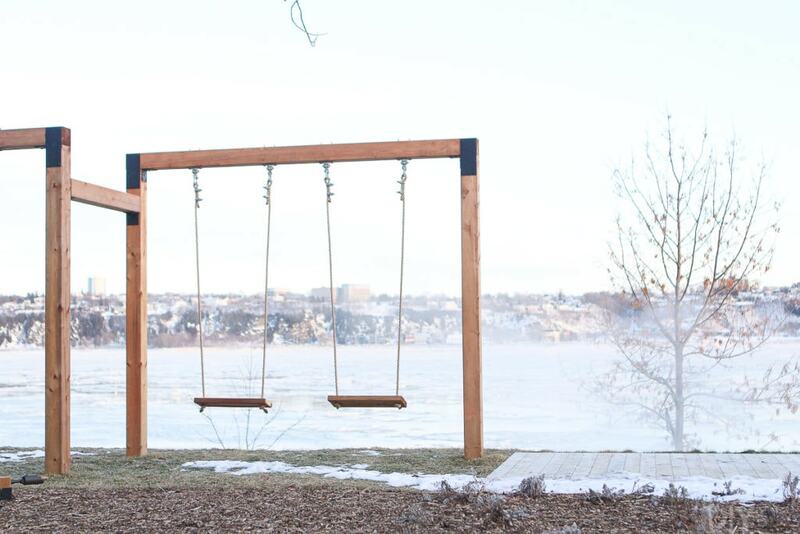 The property is set right on the river and it’s modern and stunning. The concept of the thermal experience is to spend 10-15 minutes in the hot tub, 15-30 seconds in a cold pool, and then 20 minutes in a relaxation area (they have hammocks, dark rooms, silent rooms, and areas where you could curl up with a blanket). I was at first a little scared to do the cold pools, but holy smokes you feel that much more relaxed when you follow the 3 steps exactly. They give you these plush robes and you walk around the property to the various pools to sit back and enjoy. Finn and I have never ever done anything like this before, and we were blown away by how fun it was. They tell you to plan to spend about 2-3 hours there and we stayed about 3.5 (even having lunch and champagne at the end of our stay). We felt like celebs (hahaha), yet it wasn’t very expensive at all. 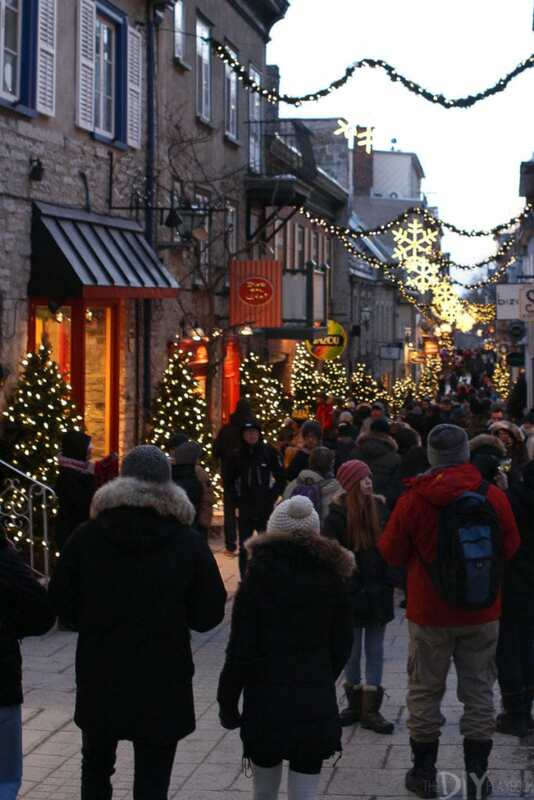 If you’re a couple heading to Quebec City…this is a must! Just be sure to go early as it got a bit more crowded in the afternoon. 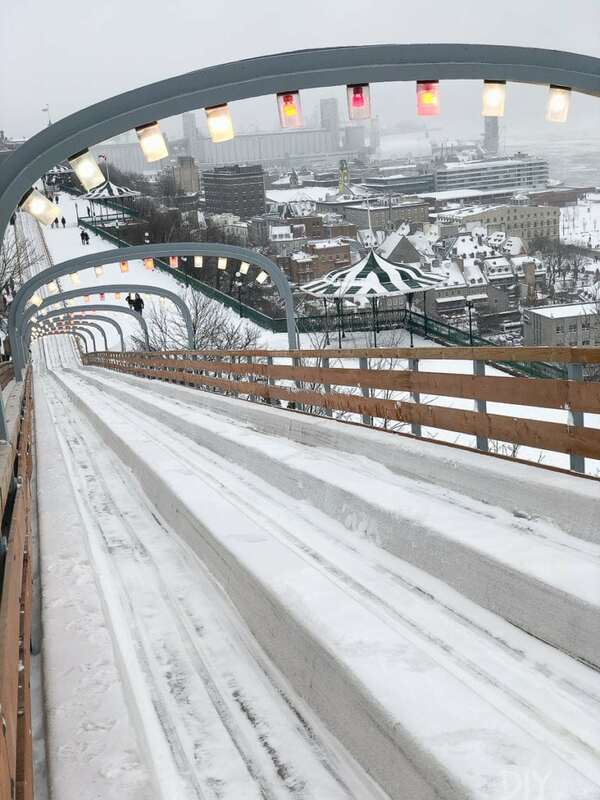 Another must-do activity is the toboggan slide that’s right next to Chateau Frontenac. It was built in 1884 and it’s only a few dollars to go down! 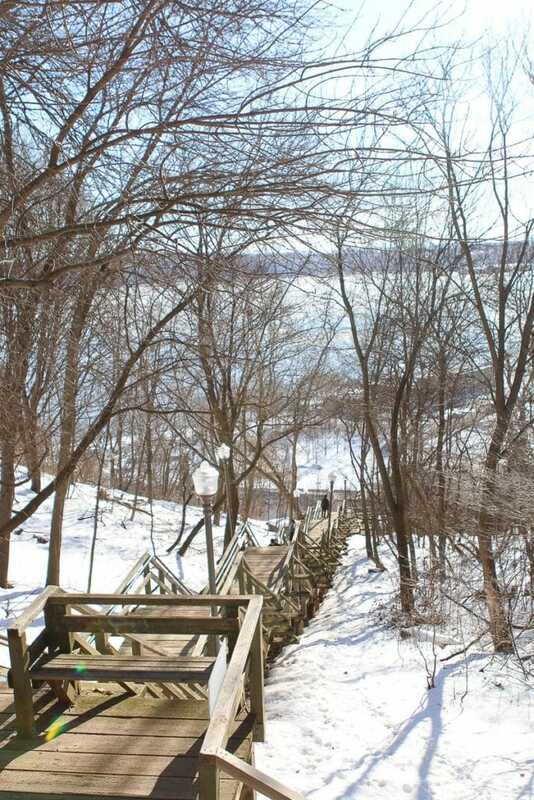 The view from the top is breathtaking and it has a view of the St. Lawrence river. Our trip down was fast and exhilarating, but very very cold. Boy, oh boy did we enjoy the food in Quebec City. Poutine was a must, along with tons of hot chocolate and boozy coffees. 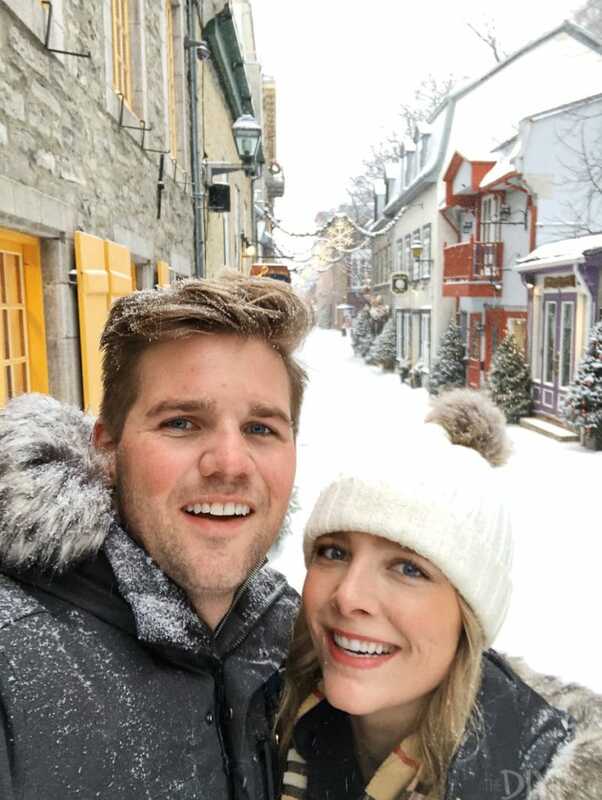 Overall we absolutely loved Quebec City and enjoyed every single minute in this magical place. 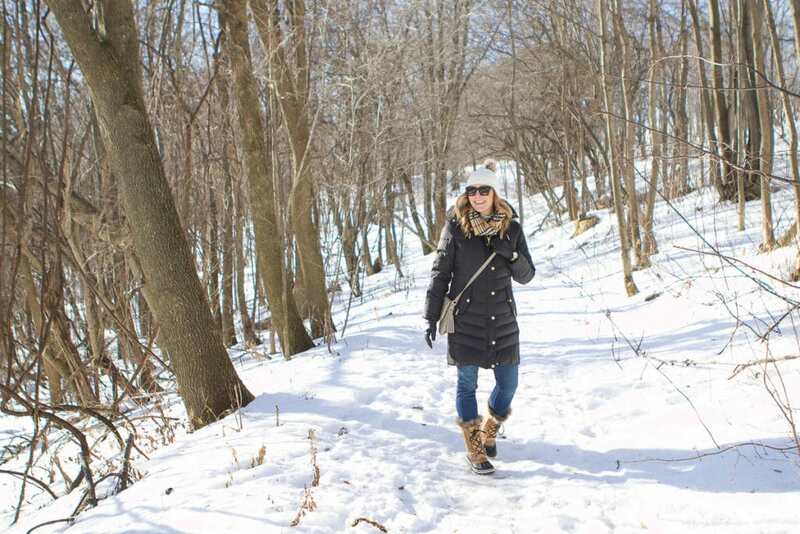 It’s the perfect weekend getaway for any couple and even families (although I wouldn’t suggest going with really young kids as it’s very hilly and slippery, so strollers would be tough!). 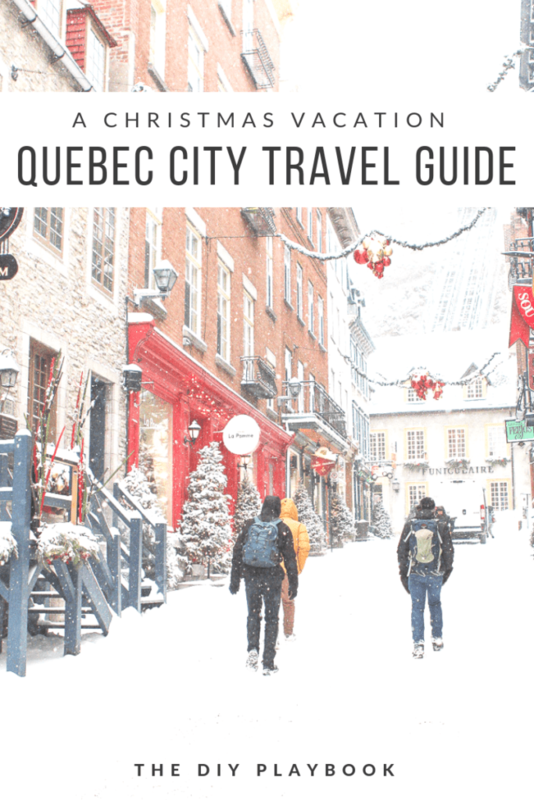 And I hope this Quebec City travel guide is helpful as you plan your winter trip there. Next time, I’d want to go the week before Christmas to really get in the mood before the big day. This trip was exactly what Finn and I needed to end 2018. A special place that just the two of us could enjoy.